Although India obtained its independence on 15 August 1947, it did not yet have a permanent constitution; instead, its laws were based on the modified colonial Government of India Act 1935, and the country was a Dominion, withGeorge VI as head of state and Earl Mountbatten as Governor General. On 28 August 1947, the Drafting Committee was appointed to draft a permanent constitution, with Bhimrao Ramji Ambedkar as chairman. While India'sIndependence Day celebrates its freedom from British Rule, the Republic Day celebrates the coming into force of its constitution. A draft constitution was prepared by the committee and submitted to the Assembly on 4 November 1947. The Assembly met, in sessions open to public, for 166 days, spread over a period of 2 years, 11 months and 18 days before adopting the Constitution. After many deliberations and some modifications, the 308 members of the Assembly signed two hand-written copies of the document (one each in Hindi and English) on 24 January 1950. Two days later, the Constitution of India became the law of all the Indian lands. The Constitution of India was passed on 26 November 1949, 10.18 AM IST, but it came into effect completely only on 26 January 1950. Following elections on 21 January 1950, Rajendra Prasad was elected as the president of India. The Indian National Congress and other parties had been celebrating 26 January as a symbol of Independence, even before India actually became independent. Thus, applying the constitution on 26 January, to mark and respect 26 January and the freedom struggle and the freedom fighters. The amending mechanism was lauded even at the time of introduction by Ambedkar in the following words: "We can therefore safely say that the Indian federation will not suffer from the faults of rigidity or legalism. Its distinguished feature is that it is a flexible federation. "The three mechanisms of the system derived by the Assembly, contrary to the predictions, have made the constitution flexible at the same time protected the rights of the states. They have worked better than the amending process in any other country where Federalism and the British Parliamentary system jointly formed the basis of the constitution." What Sir Anthony Eden, the Prime Minister of the United Kingdom (April 1955 to January 1957), said at the time of the emergence of Indian Republic is relevant in this context. He said, "Of all the experiments in government, which have been attempted since the beginning of time, I believe that the Indian venture into parliamentary government is the most exciting. A vast subcontinent is attempting to apply to its tens and thousands of millions a system of free democracy... It is a brave thing to try to do so. The Indian venture is not a pale imitation of our practice at home, but a magnified and multiplied reproduction on a scale we have never dreamt of. If it succeeds, its influence on Asia is incalculable for good. Whatever the outcome we must honour those who attempt it." Even more meaningful was the opinion expressed by an American Constitutional authority, Granville Austin, who wrote that what the Indian Constituent Assembly began was "perhaps the greatest political venture since that originated in Philadelphia in 1787." Austin has also described the Indian Constitution as 'first and foremost a social document.' ... "The majority of India's constitutional provisions are either directly arrived at furthering the aim of social revolution or attempt to foster this revolution by establishing conditions necessary for its achievement." 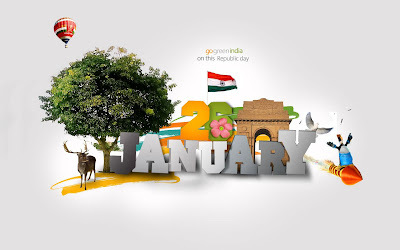 To mark the importance of the occasion, every year a grand parade is held in the capital, New Delhi, from the Raisina Hill near the Rashtrapati Bhavan(President's Palace), along the Rajpath, past India Gate . Prior to its commencement, the Prime Minister lays a floral wreath at the Amar Jawan Jyoti, a memorial to unknown soldiers at the India Gate at one end of Rajpath, which is followed by two minutes silence in the memory of unknown soldiers. Thereafter he/she reaches the main dais at Rajpath to join other dignitaries, subsequently the President arrives along with the chief guest of the occasion. 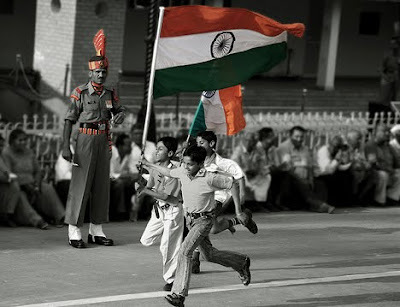 First he unfurls the National flag, as the National Anthem is played, and a 21-gun salute is given. Next, important awards like the Ashok Chakra and Kirti Chakra are given away by the President, before the regiments of Armed Forces start their march past. The different regiments of the Indian Army, Navy, and Air Force march past in all their finery and official decorations. The President of India who is theCommander-in-Chief of the Indian Armed Forces, takes the salute. Floats exhibiting the cultures of the various states and regions of India are in the grand parade, which is broadcast nationwide on television and radio. Also part of the parade are children who win the National Bravery Award for the year. 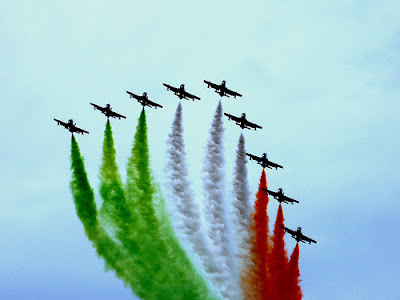 The parade also includes other vibrant displays and floats and traditionally ends with a flypast by the Indian Air Force jets. Celebrations are also held in state capitals, where the Governor of the state unfurls the national flag. If the Governor of the state is unwell, or is unavailable for some reason, the Chief Minister of the state assumes the honour of unfurling the National Flag of India. 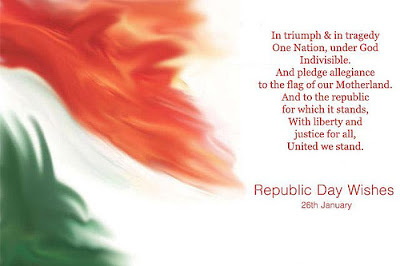 Today, the Republic Day is celebrated with much enthusiasm all over the country and especially in the capital, New Delhi where the celebrations start with the Presidential address to the nation. The beginning of the occasion is always a solemn reminder of the sacrifice of the martyrs who died for the country in the freedom movement and the succeeding wars for the defence of sovereignty of their country. Then, the President comes forward to award the medals of bravery to the people from the armed forces for their exceptional courage in the field and also the civilians, who have distinguished themselves by their different acts of valour in different situations. To mark the importance of this occasion, every year a grand parade is held in the capital, from the Rajghat, along the Vijaypath. The different regiments of the army, the Navy and the Air force march past in all their finery and official decorations even the horses of the cavalry are attractively caparisoned to suit the occasion. The crème of N. C. C. cadets, selected from all over the country consider it an honour to participate in this event, as do the school children from various schools in the capital. They spend many days preparing for the event and no expense is spared to see that every detail is taken care of, from their practice for the drills, the essential props and their uniforms. The parade is followed by a pageant of spectacular displays from the different states of the country. These moving exhibits depict scenes of activities of people in those states and the music and songs of that particular state accompany each display. Each display brings out the diversity and richness of the culture of India and the whole show lends a festive air to the occasion. The parade and the ensuing pageantry is telecast by the National Television and is watched by millions of viewers in every corner of the country. 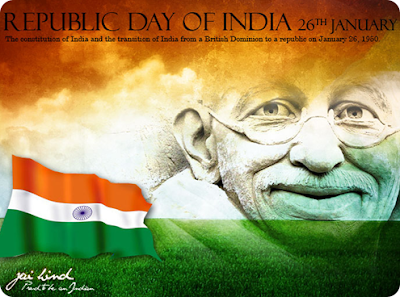 The patriotic fervor of the people on this day brings the whole country together even in her essential diversity. Every part of the country is represented in occasion, which makes the Republic Day the most popular of all the national holidays of India.